My heart is aching as I write to you of Little Dodger’s last days with us. His death came as such a shock, I couldn’t bring myself to write any sooner, and even now it is very difficult. Oh, how I wanted Dodger to be happy again and well enough to be reunited with Isabelle in their beautiful habitat. I miss him desperately. I was not ready to say goodbye. Dodger was doing so much better. Every day he was eating more, gaining weight and seemed stronger, as you will see in the video we made the day before his death. Dodger was quite the fighter... but his illness was more than his fragile little body could overcome. Throughout his illness, Dodger was surrounded by humans who loved him. Of course, we are no match for monkey love. We know he missed Isabelle and his other marmoset friends. Still, I don't believe Dodger suffered. If he did, he was very good at hiding it. I was cradling Dodger to my heart when he passed. I selfishly asked him to come back. Maybe he only stayed as long as he did because we were so intent on keeping him alive. I will miss Dodger's outrageous personality. There were no other monkeys in all of Munchkinland to compare with the antics of Dodger and Isabelle. Dodger will be remembered for a long, long time, by everyone who ever met him. Little Dodger had a good life at Jungle Friends, filled with fun, love and companionship. I know that Dodger is at peace. 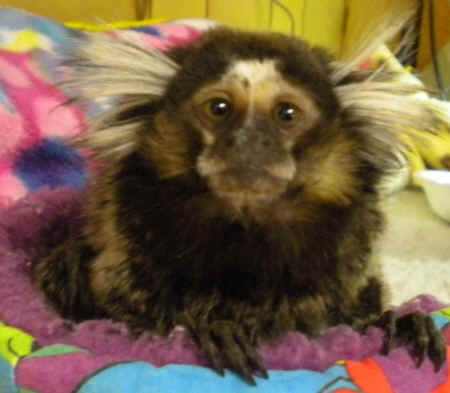 Dodger is a 5-year-old male white-faced capuchin. He was purchased as a pet by a man who and given Dodger as a Christmas present to his wife Norma. His new human mom knew nothing about monkeys, as Dodger was an unexpected surprise, so she searched high and low for information on how to take care of him. However, most pet stores and zoos were either unwilling or unable to give her information, and she was given mis-information regarding his nutritional needs. Dodger is Jungle Friends' "little man". He became very ill due to a vitamin deficiency and as a result, his growth was stunted. Even though he is sexually mature and fully-grown, he only weighs about only 2.5 pounds (a capuchin monkey of his age usually weighs around 7-8 pounds). Dodger has a very sweet disposition, but don't cross him-he is a monkey after all! Dodger's "owner" realized that since she was working two jobs and because his human sister was leaving for college, it was not in Dodger's best interest to leave him at home all day by himself. She called Jungle Friends asking for our advice, and decided it would be best for him to come live here. While Dodger's habitat was being constructed at Jungle Friends, Dodger and his "mom" came to visit every weekend so that he could become acclimated and be around other monkeys-for the first time! We were amazed at how quickly Dodger took to his new surroundings. Almost immediately, he was jumping and playing, enjoying the room to run and swing. Dodger came to be a full-time resident of Jungle Friends in April 2000. He has even become more comfortable and curious about the other monkeys. He was probably able to acclimate so quickly because his human family is still very much involved in his life. They come to volunteer on the weekends and drop in for visits during the week-Dodger is very lucky to have a "mom" that cared for him so much that she realized it was best to let him come here and live like a monkey with other monkeys. He now shares a habitat with Corky and Kelli. Dodger fit right into the Jungle Friends' family and he is adored by all of the volunteers!